A Slow food experience In ada, Michigan. Eighteen years of living in Italy has ingrained in us the value of simple, well prepared food. Our emphasis is on the best ingredients we can find and dishes that remind us of our time abroad. Combine that with a comfortable atmosphere and welcoming staff and you have the Nonna’s experience, whether you're visiting us at The Trattoria or the Pantry. Enjoy a French style omelette with fresh mushrooms and goat cheese, or avocado toast with a fried egg on top. Indulge in a delectable Baked French Toast with real maple syrup, Gluten-free buckwheat pancakes with a berry compote or a simple muffin and cup of coffee. Bacon, of course and you can spend time with the Wall Street Journal or the New York Times and a well-made latte. Choose from chicken salads made with house-roasted chickens or the fresh pasta crafted in Italy or by hand in our kitchen. We offer homemade meatballs, chicken pot pies from scratch and fresh, house-made mozzarella served with our own pesto. If the weather is good, sit on our deck under the maple tree, and of course, feel free to round things out with a glass of wine or a refreshing draft beer. Enjoy weekly specials, interesting pastas and starters, flavorful, satisfying main courses and handmade European desserts, from the chefs in our kitchen, or the bakers across the street. Start your meal with a cocktail or choose a bottle of wine from our well-stocked cellar, and expect to see all our offerings expand and change with the seasons. 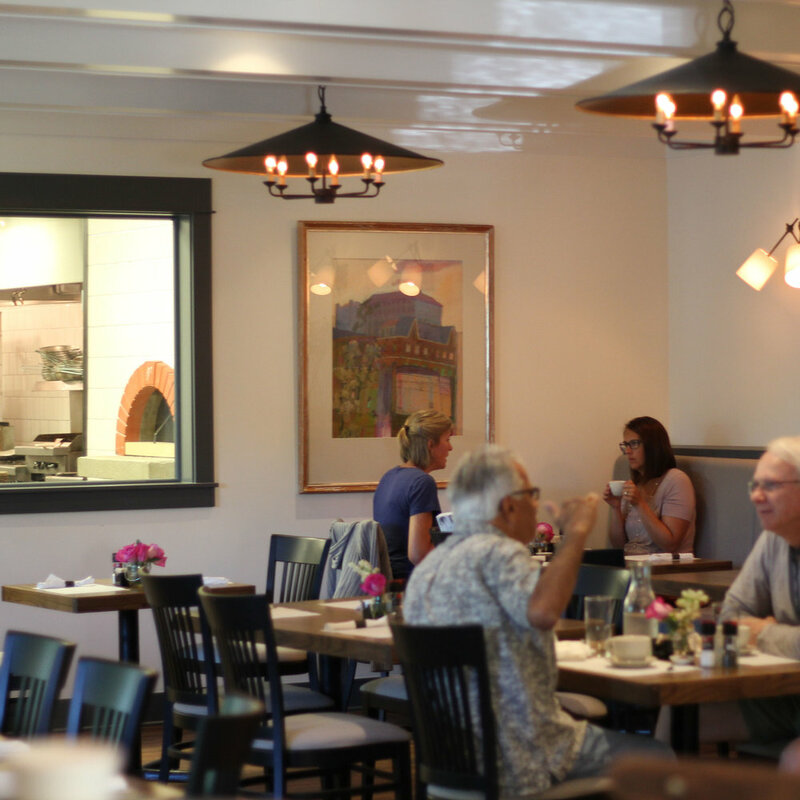 Our cozy space at 591 Ada Drive offers fresh housemade pasta, along with our lineup of pastries and desserts that you've come to love. Enjoy a coffee with a friend in the casual cafe atmosphere, or take your treats to savor later. Need catering for a bigger group? The Pantry is happy to provide lunch and pastry platters for meetings and events of all sizes. If your event needs to make a sweet statement, our talented bakers can create custom cakes and pastries to suit your needs. Hour vary between locations. Please call to verify. please use the form on the right. *please note, the contact form is not available for reservations, catering or pick-up at this time.